This is a medical story that is happening all over America – a story about doctors making medical decisions and not listening to patients (in this case an astute Mom). This is a story that is all too familiar to Niemann Pick Type C families — misdiagnosis for months or even years when symptoms seem to be clear cut. The Bouchard family of Frisco, Texas, is now stuck with a $40,000 dollar medical bill which is due to a breakdown in our medical system. This is a story that medical professionals should read and should also be put in front of Congress and the President. Twins Cathryn and Corynne have since died. Rest in peace little "angel twins!" Our beautiful identical twin girls, Cathryn and Corynne (who were a surprise pregnancy), were born on September 7, 2006. 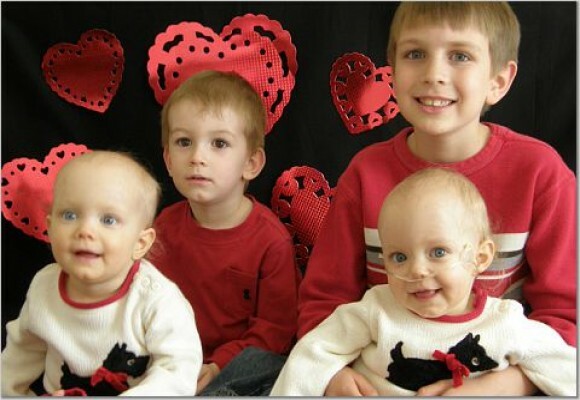 Like many other twins, they were born prematurely at 34 weeks. They had no major complications at birth, but spent 2 weeks in the NICU as “feeder-growers” to work on feeding and gaining some weight. They were quite jaundiced at birth and spent a few days in the “tanning bed” under the bili lights. I remember one of the nurses sort of asking herself out loud, “Why are they so jaundiced?” I thought it an odd question since so many babies are born with jaundice, and especially premature babies. I didn’t think much of it at the time. In following up with blood work, the bilirubin level that was high got back to a normal level; however, one of Cathryn’s liver enzymes, the AST level, showed up elevated in the blood work. My pediatrician said that we should recheck it in another month. Two more months of rechecking brought the same result: an elevated AST level. At this point we went to see a gastroenterologist. He looked at Cathryn and evaluated her, and also sort of looked Corynne over, and thought that they seemed fine – we would recheck the bloodwork in 6-8 weeks. He did tell me that they both had an enlarged liver and spleen. I thought to myself – whoa – that doesn’t sound good. I’m going to have to do some research on that. Being someone who worked as a research scientist for 2 years, I know how to find good information from reputable sites on the Internet. I typed in “enlarged liver and enlarged spleen” on a Yahoo search. I didn’t like what I found. One of the first things that came up was a rare disease called Niemann-Pick disease – a fatal neurological disease. I read some of the symptoms and signs of the disease, and I freaked out. I really felt like this was a strong possibility for my twins. After talking to my pediatrician about what I had found, she encouraged me not to worry about that yet, but she agreed that it was a possibility. During those next couple of months, I really started to notice some delays in what the girls were doing, or not doing, really. It seemed that it was taking them longer to learn to sit up and to roll over, unlike my son who had done these things quite a bit earlier. They also were not gaining weight at the same rate they had been. Corynne, my twin B, seemed to be stuck at the same weight for a couple of months. It was hard to determine if these delays were just due to their prematurity, or something else. I tried to keep the thoughts about Niemann Pick in the back of my mind. I took the girls back to the GI doctor because of their failure to gain weight. At this point he agreed that something was clearly not right, and ordered a huge panel of tests for metabolic disorders, as well as hepatitis and even cystic fibrosis. Everything came back normal, except that Corynne’s AST was also high. I didn’t know what to think at this point – I was relieved that we hadn’t found anything, but also more worried, because we still didn’t know what was wrong. I did more research into Niemann Pick Type C, and really started to feel like this was a strong possibility for my twins. It had to be something genetic – it just had to be – otherwise, why would they both be affected the same way? I mentioned my fears of a metabolic storage disease to the GI doctor, and he said he felt like they would have been so much sicker if that were the case. Again, I felt somewhat relieved that my doctors were telling me they didn’t think that our kids had a fatal disease, but at the same time, mother’s intuition was telling me something different. The girls turned 1 year old. They still weren’t talking or babbling a lot, and neither of them was interested in putting weight on her feet. I thought of how my son was very close to walking on his own by this age, and how he could even say several words. By this time, my pediatrician had set up an appointment for us with a metabolics/genetics clinic at Children’s Medical Center in Dallas. It was scheduled for Tuesday, September 25th. We would never make it to that appointment. On Friday, September 21st, I took Corynne to see our pediatrician. She had been breathing somewhat fast for maybe a week or so, and in that week had started refusing to eat. She cried a lot, and didn’t sleep well at night at all. The pediatrician sent us over to the hospital for a chest x-ray. I didn’t even make it back home before the doctor called me on my cell phone. She asked me if I was still near the hospital. I told her that I had made it back to my area and needed to pick up my son from preschool. She told me that the radiologist had called her about Corynne’s x-ray, and said that it looked really bad – like she had some kind of pneumonia. I was dumbfounded – how could the kid have pneumonia without a fever or coughing at all? This was weird. Since I couldn’t come right back to the hospital, the doctor told me she was going to call a pulmonologist and have him look at the x-ray. Within the next hour she called me again and told me I should bring Corynne to the hospital as soon as I could. I packed a few things, loaded all 4 of my kids in the car, and went to the hospital. After arriving at the PICU, I had to recount the twins’ entire medical history to multiple doctors – the PICU doctors, the infectious disease specialists, and finally the geneticist. I expressed my concern to each one of them that I felt like they most likely had some type of metabolic storage disease, and that Niemann-Pick disease was one I felt strongly about from what I had read. I remember the geneticist saying to me, “Oh, your kids don’t look Niemann-Pickish to me.” I felt so relieved – I certainly didn’t want this to be the diagnosis – yet so confused. If it wasn’t that, then what in the world was wrong with my babies?? For almost a week, Corynne underwent countless procedures and tests to try to determine what was wrong with her. After one procedure she was put on a ventilator because the trauma of what she was going through was making her worse. After about 5 days of not being able to figure out what was wrong, the doctors came to us and said they needed to do a liver and lung biopsy to determine what was wrong. Again, I asked every doctor I spoke to about the possibility of a metabolic storage disease. Every one of them told me. “No, your kids don’t really fit that very well. They don’t have neurological problems.” I cannot express how frustrated I was with this answer. What were they reading that I wasn’t reading?? Everything I read seemed to fit my kids perfectly, especially now that the lungs were involved. But, we needed to get a diagnosis. Fine, let’s do the biopsies. I think it was the next day when the geneticist came to Corynne’s hospital room. She said that she had just talked to the pathologist, and that he had found “foam cells” in Corynne’s lungs. I didn’t need to hear anymore. At that point, I knew that mother’s intuition and internet research had been right all along. My kids were going to die. Not just one, but both of my beautiful, sweet babies. I wondered if Corynne would ever make it out of the hospital – if she would ever see her home and her siblings again. The geneticist told me she was going to send out a test for Niemann-Pick disease. I wanted so badly to say “I told you so.” She felt like it was probably Type A because it was showing up in infancy. Again, I was baffled. I remembered what I had read about type A, and didn’t think that described my kids like the other information I had read. But, we’ll just see what the tests say. She was also going to send out a test for Niemann-Pick type C, but that one would take 6-8 weeks before we would know anything. The next week, the geneticist came and told me that Corynne’s test for type A had come back positive. My husband and I were devastated. Though it was somewhat expected, the finality of a diagnosis like that is difficult to cope with. Children with NPA typically don’t live past age 2 or 3. We sent off a test for Cathryn for Niemann-Pick type A also. I started calling specialists all over the country to find out as much as I could about this disease and potential treatments. The more I heard about type A, the more I felt like this was NOT what my kids had. Over the course of the next week, one particular doctor who believed strongly that Corynne could get better worked on weaning her off the ventilator and the strong oxygen support that she was on. Steroids seemed to be helping her lungs’ ability to transfer oxygen from her lungs to her blood. By the end of that week, she was off the ventilator and her oxygen saturation was slowly making an upward trend. I could tell Corynne was starting to feel better, and I knew that if she were going to get much better, she needed to be at home. She was terrified in the hospital. I basically told the doctors that I was going to take her home on that Friday. I knew she would need a lot of attention at home, and that she would still have to be on oxygen, but I wanted her home. I wanted our family together again. Our family had not been together at the same time for 3 weeks. We took Corynne home that Friday afternoon. It was October 12th. Within a week she did not need her feeding tube anymore – she was willing to eat again. Sometime in that next week or so I got a call from the geneticist. She had Cathryn’s test results. Her test for Niemann-Pick type A came back normal. I almost fell over. Well, what does that mean? She told me that the lab manager thought that Corynne’s was probably normal as well, and the test had just been wrong. I was thrown for a loop. Clearly, my kids had some type of metabolic storage disease – the foam cells in the lungs made that apparent. But I was filled with hope again – maybe it’s something else – maybe there will be a cure for it.The geneticist told me that there was still the possibility of Niemann-Pick disease type C, but that test was still pending and would take more time. Of course I started doing some research on type C and realized it was most likely the correct diagnosis. One article I read described the early lung failure that Corynne was experiencing, as well as the developmental delays, failure to thrive, and the enlarged liver and spleen. We waited and waited and waited. On December 11th, the geneticist called me. She had the results. It was type Niemann Pick Type C. Though it was exactly what I expected at this point, I was completely devastated and began the grieving process all over again. Over the past few months we have explored potential treatment options for our girls, but there isn’t much to be found. One experimental drug that was designed to treat a different disease seems to help prolong the lives of patients with NPC. We have started working with physical and occupational therapy, speech therapy, and a nutritionist. These wonderful people are part of a great support system that will do just that – support our girls through the course of this terrible disease that will take their lives. It won’t cure them, but will perhaps give them a better quality of life for the time they do have. Time – how precious it is. It’s all we have, and we can’t get it back. So at our house, we do what we can to enjoy every day. We don’t think too much about tomorrow and what it might bring, except to dream of a tomorrow where no parent has to wake up and face the fact that their child (or children in many cases) has a fatal disease called NPC for which there is no cure. That will be a great day. If coping with having two terminally ill children is not stressful enough, we are constantly battling our insurance company or doctors about medical bills. Corynne’s 3-week stay in the hospital proved to be extremely expensive. While the hospital was in-network, all of the doctors who saw her and the surgeons who did those biopsies were out-of-network. We did not find out about this until we brought Corynne home. The doctors who saw her on a daily basis billed $2,058 per day, for 21 days. The surgeon billed $3,000 per cut. My insurance company paid small amounts, but we were left with a bill around $40,000. I was furious. If the doctors had listened to me in the first place and tested for the disease I suggested, the biopsies would not have been necessary. If one of the social workers or hospital billing staff had brought it to my attention that all of the doctors were out of network, we might have been able to work something out before it was too late. I was able to appeal the insurance decision and they paid more, but they are still leaving me with a hefty sum. I find this totally inappropriate, and it causes us undue stress on top of the devastating situation we face daily. If a hospital is in-network, then the people who work there should be as well. If insurance companies would stop causing people so much stress about their medical bills, the population would be a lot healthier. I’m pretty sure that would cut down on insurance companies’ costs. I know my story is not the only one like this, that that just infuriates me more.